Packed with over two hundred illustrations, this is the fifth book in the Stenlake mining series. As well as gritty pit head scenes, the vibrant social life of these close-knit communities is not neglected and there are many scenes of social and sporting activities such as the local colliery bands and football teams. 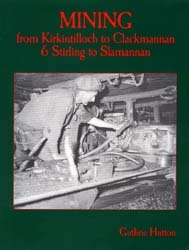 The somewhat unwieldy title reflects the broad area covered – the old counties of Clackmannanshire, Stirlingshire and East Dunbartonshire and the valleys of the Kelvin, the Bonny, the Forth and the Carron together with the Slamannan Plateau. Communities include: Baldernock, Kirkintilloch, Croy, Twechar, Auchenreoch, Kilsyth, Nethercroy, Dullatur, Denny, Bonnybridge, Redding, Shieldhill, Slamannan, Standburn, Maddiston, Falkirk, Grangemouth, Airth, Plean, Bannockburn, Cowie, Millhall, Fallin, Glenochil, Alloa, Sauchie, Tillicoultry, Dollar. Amongst the many collieries, pits and mines featured are Castlecary, Woodilee, Meiklehill, Gartshore, St Flannan's, Dumbreck, Gardrum, Polmaise, Manor-Powis, Devon, Sherriffyards and Bessie Glen.